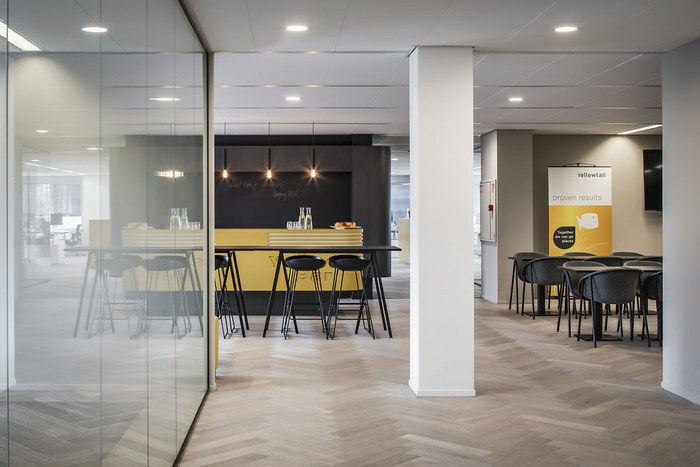 DZAP has designed the new offices of IT consultant Yellowtail, located in Naarden, Netherlands. Yellowtail, provider of innovative IT-solutions moved to a new office in Naarden. Their new office interior has been given a clear signature of Yellowtail. Values such as innovative, stylish, warm, flexible, fresh, inviting and fun were the starting point for the design. In combination with their brand-color yellow it became a loud and clear recognisable office of Yellowtail. For their employees they wanted an open and transparent interior in which they can easily swap to another work-area / station. Fine detail is the wooden floor, laid in a ‘herringbone’ pattern which seamlessly turns into a carpet with the same pattern.